Congratulations ! You have just won one of Lindor's Awards! The GOLDEN one! Thank you for submitting for the Lindor Award! I have completed my review of your site and it is my great pleasure to award you with a MERIT Lone Star Design Award, which is attached. I found your site full of useful and interesting content, with a easy to navigate design. Since this is not a "giveaway" award, you can enjoy your award with the knowledge that only the very best web sites receive it. Again, thank you for applying, and enjoy your award! Helen Bruce Lone Star Site Design. I found your site to be a fine example of well thought out design, with good colour combinations, excellent and amusing graphics, good navigation and most interesting and valuable content, in all a "Classic Site". 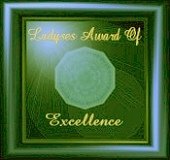 It is with great pleasure I am sending you Lorri's "Classic Site" Award. Congratulations and best wishes, Lorri. Like all of us, sites grow and improve. We are proud, but the main thing is: do our visitors appreciate the site in its present form. And oh boy, yes I do! It is so professional, the colors are pleasing, the navigation faultless and the content great. Of course a site like that wins my award. Which is really a rare occasion, as in more then two years only 36 applications were successful, yours included. And it makes me so happy to congratulate you with the LTS Grail Award. It's a standalone, so there is no improvement on that one. It's the best for the best. Your site, as listed above, has been chosen as one of the Merit winners of The Lynx Award for February 2002. I enjoyed visiting your site and found it worthy of The Lynx Award. It is evident that you have put a lot of hard work in building your site.